Town Hall Square, by Janet Rosenberg & Studio. Photograph courtesy The Cultural Landscape Foundation. If you want to see why cities are centers of energy, look at the remarkable transformation underway in Toronto (and avoid the sideshow involving the embattled current mayor). Canada's largest city, which recently surpassed Chicago to become North America's fourth most populous, is amid the most ambitious level of development in generations. Moreover, landscape architecture, often the last and frequently underfunded component in development projects, is leading the charge in places like the city's Waterfront district with innovative and inspiring new work by Claude Cormier + Associés, West 8, Michael Van Valkenburgh Associates and others. All of this activity supports a growing city. According to the Toronto Star, in the past year the city's population surged 38,000 to nearly 2.8 million, and there's no end in sight. Corktown Common, by Michael Van Valkenburgh Associates. The 18-acre park is still under construction. In the background, several of the 182 construction sky cranes currently operating in Toronto. Photograph courtesy The Cultural Landscape Foundation. Jennifer Keesmaat, the city's dynamic and relatively new chief planning director, says there are 182 construction sky cranes currently in operation. Condominium towers are sprouting like mushrooms after a spring rain and another 62,500 units, not yet under construction, have either been approved or are awaiting approval. Indeed, touring Toronto, one is struck by the juxtaposition of immense glass skyscrapers and the city's older stock of Victorian-era architecture. According to the Economic Dashboard - May 2013 produced by the city's Economic Development and Culture Division, there were 173 high-rise buildings under construction. This could be a problem in a city where comprehensive planning has long been elusive (a plan by the Olmsted Brothers landscape architecture firm released in 1912 was only partially implemented). Fortunately, Keesmaat, who says she's planning for how people will live 30 years from now, has outlined an ambitious and holistic set of priorities including: "creating a spectacular public realm through design excellence and strategic investments ... planning for transit, cycling and walking ... pursuing mid-rise development on our avenues to create walkable, complete neighborhoods/communities ... exponentially increasing the number of Heritage Conservation Districts (HCD) in the city." There are currently 21 such districts; an additional five HCD's were just launched to be followed shortly by five more. Keesmaat said: "This is an important counter point to our hyper paced growth." Moreover, the City Council recently adopted Tall Building Design Guidelines to protect historic views and neighborhood context. Corktown Common, by Michael Van Valkenburgh Associates. Part of a new water feature in the 18-acre park, which is still under construction. Photograph courtesy The Cultural Landscape Foundation. Corktown Common, by Michael Van Valkenburgh Associates. The Maryann Thompson-designed pavilion and part of the playground at the 18-acre park, which is still under construction. Photograph courtesy The Cultural Landscape Foundation. As part of this transformation, what's particularly noteworthy is Toronto's use of landscape architecture as a development catalyst, especially along the city's waterfront. James Roche, director of parks, design and construction for Waterfront Toronto, gave me a tour of several outstanding new projects starting with Corktown Common, the 18-acre Van Valkenburgh-designed park that's part of the larger West Don Lands area. If executed as planned, the entire 80-acre precinct will ultimately include 6,000 residential units, and 23-acres of parks and public space. Van Valkenburgh's inspiring design, which includes a soaring Modernist pavilion by architect Maryann Thompson, is a triumph of aesthetics and environmental responsibility. Waterfront promenade by West 8. Photograph courtesy The Cultural Landscape Foundation. Parks and projects along the waterfront are linked by a new promenade by West 8, which includes their signature Timber Seats and paving with stylized maple leaves. 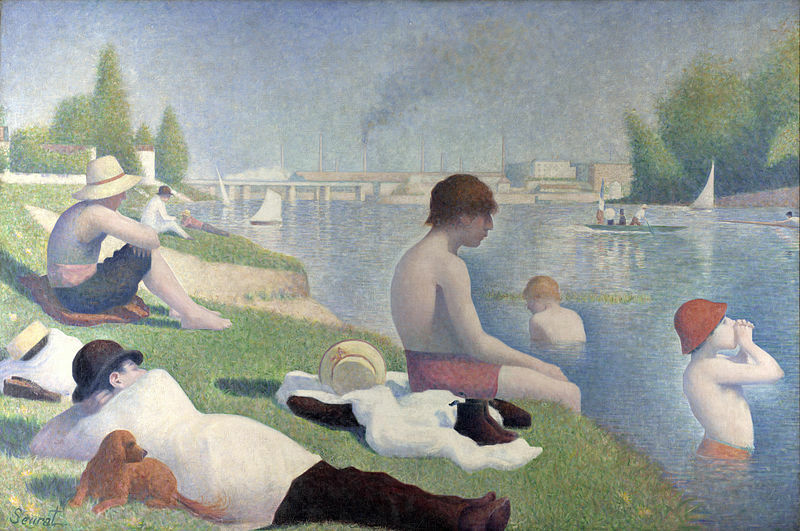 Georges Seurat, Bathers in Asnières, 1884, The National Gallery, London. Photograph courtesy Wikipedia. Sugar Beach, by Claude Cormier + Associés. Photograph by Nicola Betts, courtesy Claude Cormier + Associés. Sugar Beach, which opened August 2010, makes a virtue of the city's industrial heritage. Claude Cormier + Associés' theatrical, award-winning design, which recalls Georges Seurat's Bathers at Asnières, turned a parking lot into a two-acre urban beach that looks across a harbor slip to an operating sugar refinery. Rendering of Four Seasons Hotel and Residences, by Claude Cormier + Associés, courtesy Claude Cormier + Associés. Four Seasons Hotel and Residences, by Claude Cormier + Associés. Photograph courtesy The Cultural Landscape Foundation. 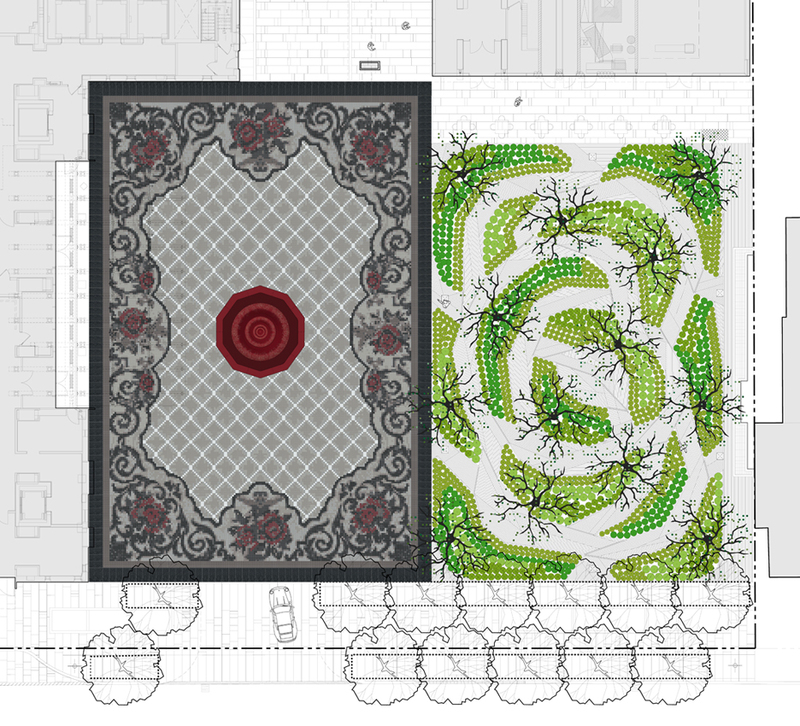 In the city's Yorkville neighborhood, a newly completed 1.7-acre Cormier-designed project adjacent to the Four Seasons complex features two distinct sites - an "urban carpet" with a super scaled Victorian fountain and a "rose less rose garden." The work acknowledges the neighborhood's Victorian architecture and garden heritage (e.g. the adjacent firehouse is a witness to this past tradition), while being very contemporary. Cormier, who calls himself a "closet case Postmodernist", talks of the importance of design "being of our time." Rendering of Town Hall Square, courtesy Janet Rosenberg & Studio. Town Hall Square, by Janet Rosenberg & Studio. Photography Credit: Neil Fox, Peter Sellar, Janet Rosenberg & Studio, courtesy Janet Rosenberg & Studio. 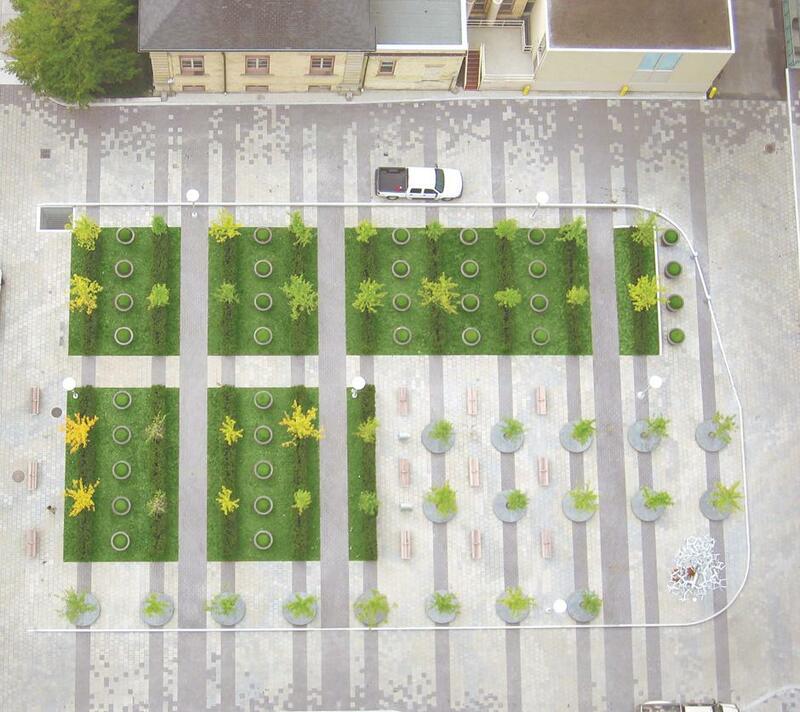 On the same block of Yorkville Avenue, the award-winning Town Hall Square by landscape architect Janet Rosenberg weds traditional patterning of a French parterre with the Modernist sensibilities of Dan Kiley, in the spatial orientation of trees, while a nod is made to Martha Schwartz's "bagel" shaped seating and there are super scaled elements characteristic of Postmodernism. Significantly, with these designs the city both looks back and looks forward, and looks back to look forward ... which brings us to the current state of the city's extant and diverse designed landscape legacy. Village of Yorkville Park, by Schwartz Smith Meyer Landscape Architects, Inc. and PWP Landscape Architecture, with Oleson Worland Architects. Photograph courtesy The Cultural Landscape Foundation. 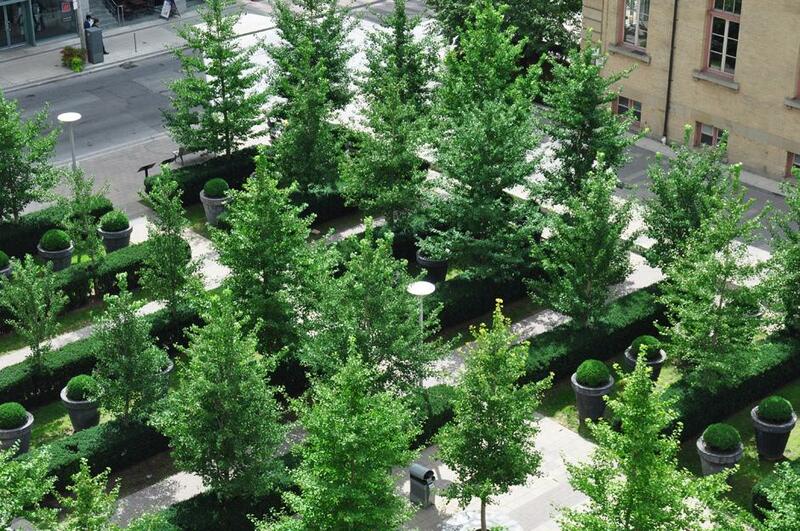 Dead trees have not been replaced at the Village of Yorkville Park, by Schwartz Smith Meyer Landscape Architects, Inc. and PWP Landscape Architecture, with Oleson Worland Architects. Photograph courtesy The Cultural Landscape Foundation. Only blocks from Yorkville Avenue is the Village of Yorkville Park, a small, but influential design and unique collaboration by landscape architects Martha Schwartz, Ken Smith, David Meyer, and PWP Landscape Architecture, with Oleson Worland Architects. Completed in 1994, the park, was the 2012 recipient of the prestigious Landmark Award from the American Society of Landscape Architects, although sadly, is suffering from insufficient maintenance. University Avenue parks, by Dunington-Grubb. Photograph courtesy The Cultural Landscape Foundation. The same fate is befalling the exceptional series of small, pioneering Modernist parks in University Avenue's median designed by the British-born husband and wife team of Howard Burlington Grubb and Lorrie Alfreda Dunington. The Dunington-Grubbs, as they are known (he adopted her last name when they married in the early 1900s), who emigrated to Canada in 1911, were founding members of the Canadian Society of Landscape Architects and established a highly influential practice. Allan Gardens Park and Conservatory. Photograph courtesy The Cultural Landscape Foundation. Allan Gardens Park. Photograph courtesy The Cultural Landscape Foundation. Elsewhere, the Victorian-era Allan Gardens park and conservatory looks even shabbier and features a gigantic dog park - actually one for large dogs and one for small dogs - at its entrance. I'm not opposed to dog parks, but the location of this one, which severs the park from its contiguous community, is questionable. Friends of Allan Gardens, a group of civic-minded individuals including architect Michael McClelland of ERA Architects Inc. is trying to establish a conservancy for the park (McClelland's firm is a significant presence in the restoration and rehabilitation of major sites throughout the city), and also identify its designer. Several other parks I visited showed similar signs of wear and lack of maintenance - much as many US parks did before the advent of park conservancies modeled on the successful and influential one for New York's Central Park. Unfortunately, there's still an expectation in Canada that maintenance is the government's responsibility. Speaking more broadly, McClelland said: "We need to assess the cultural value of Toronto's designed landscapes so we can insure their longevity. And stewardship enforces the idea that if we are to maintain those significant landscapes we have to adopt models for public/private partnerships." I agree. For the city's earlier and newly minted parks to survive, conservancies and public/private partnerships will be essential. The good news is that Toronto has many enthusiastic and energized supporters including Rosenberg, McClelland, the influential TreeHugger.com's peripatetic Lloyd Alter, and Scott Mullin, Vice President of Community Relations at the TD Bank Group, who says: "We are interested in supporting groups like Park People that are thinking in new ways about parks and how they deliver enhanced social and environmental benefits to our communities." Rosenberg says there's a palpable shift in attitude and awareness: "The city is more enlightened, there's a recognition that public space is important and that good design makes good business. Throughout the city there are little initiatives that collectively have turned into one big positive thing." "It's our time," Rosenberg confidently declared, "We have the momentum." The Cultural Landscape Foundation is laying the groundwork for an international conference on landscape architecture to be held in Toronto in Spring 2015. The conference will be followed by What's Out There Weekend Toronto featuring free tours of the city's designed landscapes.